Arm outstretched, she invites. Each sequin vibrates, shimmering under the neon stage lights as the sounds of synth and drum beats reverberate from the walls. From the second her voice pierces the air, you are hit with a range of sensations, all combining to bring me to one conclusion. 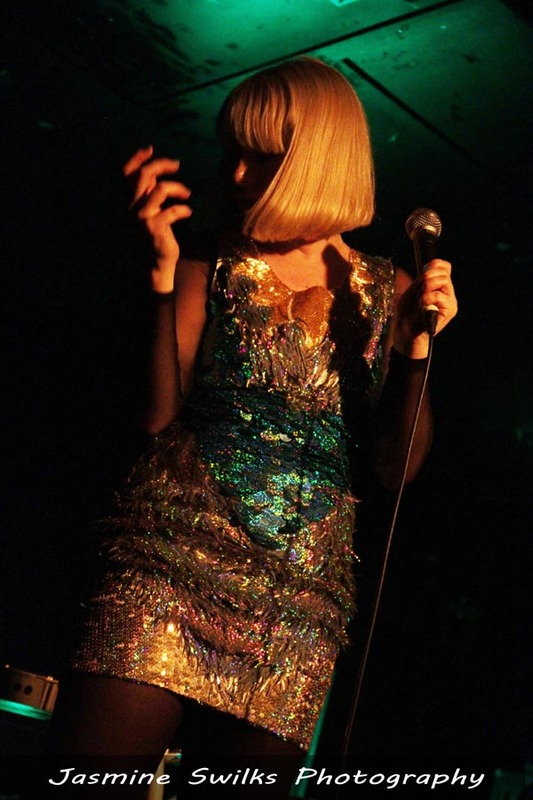 Phebe Starr is no ordinary performer. It is impossible not to turn into a pin cushion of goose bumps when I listen to Starr. The way she both jitters and glides around the stage is a beautiful juxtaposition. From start to finish, this young Sydney artist takes you on a journey that is powerful, haunting and a little bit quirky. Combining electronic samples, synthesiser beats and layered effects with her vocals, she creates an atmosphere that must be experienced to be understood. Dressed in an assortment of sequins, a flowing black cape and leather boots, Starr is the epitome of quirk chic. One particular moment that stood out to me during the set was Phebe’s cover of The Cure’s ‘Let’s go to Bed’; a performance that was nothing short of magic. Breathtaking, powerful, violently passionate; there is a story to be heard in everything she sings. Those of us at Heavy and Weird are always on the lookout for new and exciting Australian artists, so when I saw that Starr was to perform at ‘The Zoo‘ in Brisbane this month, I knew I needed to interview her. Since first watching Starr perform 2 years ago at a small tavern in NSW, I have followed her journey with interest. To see such a great Australian artist going from strength to strength is a great reminder of the value of Australian music. Starr has recently toured with artists such as ‘Ball Park Music’, ‘Of Monsters and Men’ and ‘Stars’, and is also a ‘Triple J Unearthed Feature Artist’. Her single ‘Alone with You’ has soared to almost 26,000 views and she is about to embark on some incredible international tours later this year. Surprisingly, Phebe Starr and I both went to the same school in the northern NSW town of Coffs Harbour, yet before this interview, had never personally met. Speaking backstage after the show, I was relieved to see how down to earth, funny and intelligent this talented young woman was. Taking a seat in the courtyard at a petite, spotty plastic table, Starr and I sat down to talk about her journey, including what it’s like performing with mainstream artists, backstage shenanigans, joking around with Ben Folds Five, and… dinosaurs. JS: Hi Phebe, thanks for chatting with me tonight! JS: So, how did you think your show went tonight? PS: The ‘Stars’ tour has been really good! it’s a different crowd to what I thought it would be. It’s so cool being on bigger tours and opening for bands that you heard of when you were younger. It’s always hard opening though, because people don’t really know who you are. JS: You’ve recently toured with some big names like Stars, Ball Park Music and Of Monsters and Men – is there one particular act that has stood out as a favourite to play with? PS: Ben Folds! I know it’s nothing like my music, but I used to listen to his music all the time when I was younger. I’d play piano in high school and listen to his music and sing ‘Adelllaaiddee’. And then… I was hanging out with him! JS: Was Ben Folds what you expected? JS: Did you turn into a fan girl when you saw him? PS: Yeah I did! I was all like ‘Ahhh!’ (laughs). One of my friends was having a baby and she loves his stuff, so I got him to write her a message. He wrote, “Don’t worry, the pregnancy will be over soon!” That was really cool. JS: You must have some awesome backstage stories up your sleeve by now too? PS: Yeah I reckon! I can’t think of any at the moment, but there’s always crazy stuff happening. On this tour actually – like stuff always goes wrong, anything that can go wrong will – we were loading into one of the venues in Sydney, and somehow I locked the keys in the car, with the motor running, with all the gear in the car! JS: I didn’t even know that was possible! How on earth did you lock your keys in with the car running? So yeah, stuff like that. It’s pretty funny. JS: Oh wow, that sounds tough. I was actually interested to know whether there were any really tough gigs that you’ve had along the way? PS: Oh man, SO many tough gigs. JS: I know that even well-established artists can have things go wrong, so I guess it happens to us all. What would be your toughest gig so far? PS: It’s always pretty tough when you’re supporting, because people aren’t there to see you. I love when people do come early because it’s such a blessing. It’s a battle. Every gig is a battle (laughs). You’re always trying to win people over. JS: Do you just try to put on a mask when you’re onstage and perform without worrying about what people might be thinking? Or do you have moments where you look out into the crowd and feel a bit bummed if you see someone who isn’t really listening? PS: When I perform I try and remember what it was I was feeling when I wrote the song. So I try and go back there, if that makes sense? I’m trying to give that story to people, so I think that is the most important part. Like the other night – I was so tired but I really want people to experience the emotion that I felt when I wrote the song. That’s the part of music that’s really sacrificial. You’re like, ‘I’m going to give you this, even if you don’t like it’. PS: Yeah, it’s very honest. JS: It must still be hard at the same time, but from what I saw tonight people seemed to be really into the show. Just so you know, my friend came along tonight for ‘Stars’ but after hearing you he thinks you’re awesome! PS: YAY! That makes me feel good. We’ve done 2 tours this week, and it’s still a new set up, so I’ve been so tired. The set-up we have is pretty technical, and you can’t rush it. Usually we play with a whole band, but this is a new duo. JS: I read you usually play with 2 drummers and 2 synth players! PS: Yeah, depending on the line up we usually do. This has been a last minute cram and I think it’s hardest when you feel so overworked and tired. It’s all intense emotion pouring out all the time and you don’t have any alone time. It’s taxing but it’s still a dream come true, so I can’t complain. Plus we just did a video clip. JS: Wow that’s great! Was that for Jurrasica? PS: Yeah it was. Hopefully it’s coming out really soon. JS: I thought it was cute that you named your new single ‘Jurrassica’ because I know that you love dinosaurs. Was it a conscious decision to incorporate something ‘dinosaurish’ into your music? PS: It’s cool how you know that I like dinosaurs! People haven’t asked me about that in a while. Not exactly…The way that I write is kind of different to how I think other people might write. I always get a word, or a feeling, or this vibe about something and then I write the song backwards. I come up with a concept before it’s there, and then I think about how to create that feeling again through a song – does that make sense? With Jurrassica I was on the bus and I just had this moment and the word came to me. I was like, ‘Are you serious? That’s such a corny thing!’ (laughs). I thought it was really kitsch. But I don’t know, it was just born. I didn’t understand it at the time but I just journalled ‘jurrassica’ for the next month, and all of these things came from there. Jurrassica is a battle between yourself, your flesh. One day I was with a friend and I just blurted something out, and afterwards I was like ‘Why did I say that? I didn’t mean to say that’. There’s that monster in all of us, and we all do things we regret. So the song is me trying to get away from that side of me. JS: So, were you one of those kids that grew up watching ‘The Land Before Time’? JS: My brother and I used to watch it all the time, but when we got to about 15 we looked back on it and went, ‘Wow…the graphics are really… crap’ (laughs). PS: Yeah, and it was a bit boring. “Littlefoot!” “Shutup!” (laughs). That was totally me. I think it was just cool how I’m into dinosaurs and Jurrassica came about. I love the quirkiness of dinosaurs. The story behind it though is very deep, all of my songs are really personal. JS: Going back to all those years ago when you first moved to Sydney to start your career, how would you say your music, and your sense of self, has developed? PS: It’s always been a journey, even before I moved to Sydney. Even back in the country towns I was trying to make it happen. It’s crazy how if you set out to do something, to make something happen, you end up becoming that person. It’s funny because you romanticise about how great it’s all going to be, but when you get there there’s actually a lot of responsibility and hard work. It’s been really good. I’m really thankful to start playing some big shows, and it’s really crazy to see the evolution. Setting goals and then doing them – it’s a weird feeling. I just get shocked that people like my music! It’s so honest, and I guess there’s that fear of rejection. I feel I’ve come to a point where I’m comfortable sharing now. JS: So in the beginning were you a bit more reserved? PS: A little. I think I had to grow into myself. Especially performing. I’ve always been a terrible dancer, but now I’m just free. I do what I want, and it’s great. JS: You look really comfortable onstage these days! PS: Yeah, I feel comfortable. It’s just that evolution of getting to that point. I’m always surprised when people feel what I wanted them to feel in a song. It’s so weird when that happens. JS: What’s coming up for Phebe Starr in 2013? PS: So much! I’m going to be dropping an EP soon, and the video clip for Jurrassica comes out really soon. There’s a lot of works in progress. The next few months are going to be really jam packed. We’re coming back here with Strange Talk next month, and I’m going to the US to do some tours. PS: Yeah, we’re going to be there for a month. I’m excited to release more music! Previous From ‘I’ll never let you go’ to ‘You ain’t nothin but a Ho’ – How music lyrics and attitudes towards women have changed over the decades.